The third party GravityView plugin is the best way to display Gravity Forms entries on your website, and Gravity PDF includes a basic integration which allows you to display PDF download links in your Views. 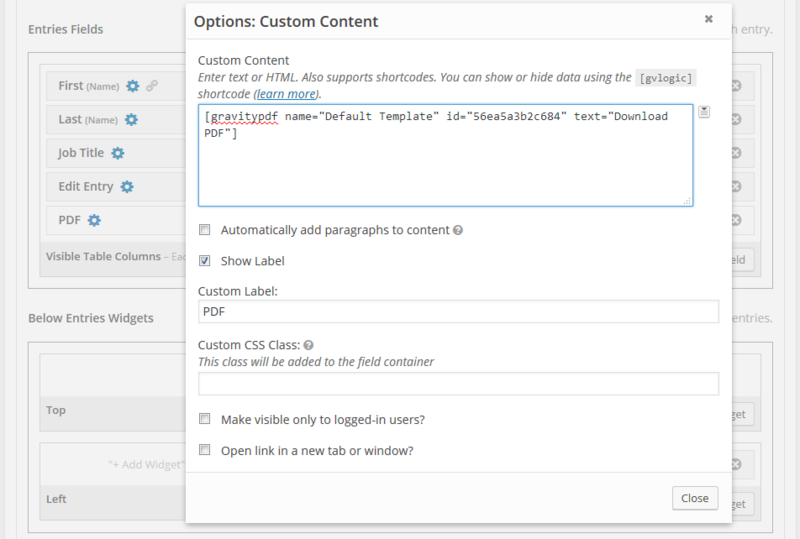 To do this you’ll need to use GravityView’s Custom Content Field. Go edit your View in the admin area, click the + Add Field button in the Multiple Entries or Single Entry tab, scroll to the bottom of the pop up that appears and click Custom Content. Next, go to your form’s Manage PDF page, copy the [gravitypdf] shortcode in the list and paste it into the View’s Custom Content Field. Save the View and go check if it’s working. Using GravityView’s Advanced Filter extension to show the entries from the current logged in user. Use a Membership plugin that allows you to show/hide content based on user roles (Paid Memberships Pro comes to mind). Then you can display the GravityView to a user with a Role that includes one of the capabilities found in Gravity PDF’s User Restriction setting – by default this is only the Administrator role. Not sure what Roles and Capabilities are? Here’s a great article from WPShout discussing the finer points. If you are positive you want to allow anyone to access the PDFs you can enable Public Access mode which disables all PDF security. Only do this if your PDFs do not contain sensitive user information.